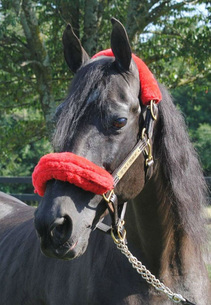 Handsome Merlin here is an (almost) 29 year old registered American Saddlebred stallion who has been owned by the same person since he was two, but was abandoned at a boarding facility as he become older and unusable. Merlin is a beautiful, sweet boy who enjoys his outside playtime and will nicker loudly for treats. This boy will most likely be a long term resident of CARES. If so, we will care for him so that he knows he is always loved.